Michael Conlan continued his rise with a clinical second-round stoppage of former European title challenger David Berna at a raucous Madison Square Garden. The Irish featherweight adropping Berna twice before the referee halted the action less than a minute into the second session. It was a solid performance from Conlan and he can be moved into tougher and bigger fights in the coming months. And a delighted Conlan said afterwards: “It meant a lot to me. I wanted to come in here and put in a great performance - a better performance than last year. I think I did. “I want to fight back in Belfast. There’s talk about it being in June. Look at this crowd. We’ll sell out any arena in Ireland and we’ve got to get back there. “I wanted to take this guy out and show I’ve improved in my first year. “ I’ve only been with my new coach a little while but I feel I’ve improved a ton. “He kept committing and as he dipped down, he brought his hands up to block his face. Once I turned southpaw, I felt that shot would be a comfortable one for me to land. “The first one I threw sucked the life out of him. “I feel I’ve improved all round. I’ve got the feel for professional boxing. “When I turned pro, it was like a sprint for me and I wanted to take them out rather than break them down. 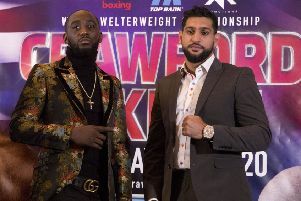 “I left my old trainer Manny Robles and it was nothing personal - it was just logistical for my family - and now I’ve linked up with Adam Booth and I feel I have a great connection with him.